I'll go ahead and say at the start of all this that while there aren't a ton of story spoilers in any of these videos, we do play through the entirety of the second campaign mission in the first video, talk about some story stuff in the second video, and then show off the Dreaming City in the fourth and fifth videos. If you're interested in thoughts/impressions on Destiny 2: Forsaken without seeing/knowing anything more than has already been revealed, then I'd skip those videos for now. The shortest summary I can give of Forsaken is this: it is the game Destiny 2 should have been when it launched last year. There are both positives ("hooray, Destiny is good again!") and negatives ("why did it take Bungie a year to get the game back to how original Destiny was?") embedded within that summary statement, but there you go. Is Destiny 2 still about running around shooting guns to get loot? Yes, and if you've never been a fan of that style of game, then you're not going to be fan of Forsaken. Is that looting and shooting better/more meaningful? Absolutely yes. There have been a number of changes to some of the underlying systems at the heart of Destiny 2 - such as the new weapon loadout scheme, collections and lore tabs readily accessible from the main menu, and much more - that were introduced with Update 2.0 a couple weeks ago, which is available to all players regardless if you own Forsaken. Perhaps the most significant changes that are only included in the expansion are the randomized perks on the weapons/armor you get, and the cost to infuse gear with higher level stuff is now more significant. Both of these changes mean you're no longer just dismantling everything you get because you got the guns/armor you wanted weeks ago. 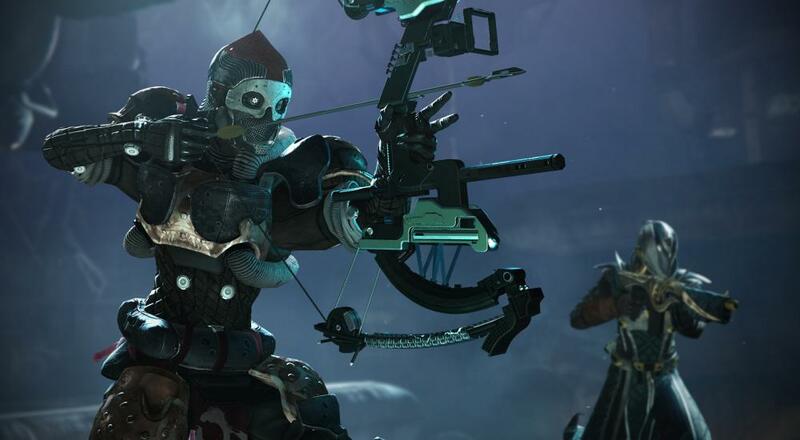 When Destiny 2 launched, weapons and armor were fixed. They'd have the same stats and perks every time you got them, so once you got that one gun or armor set you wanted, everything else was either going to get fed into those to make them stronger, or dismantled for materials. With Forsaken, every time you get a weapon or piece of armor (with just a few exceptions), the perks on it will be randomly assigned. You can get the same hand cannon 10 times in a row and each time it will be a little different than the previous one. Maybe the first one you get has Outlaw (precision kills increase reload speed temporarily) and Grave Robber (melee kills refill the magazine), and the next has Explosive Payload (bullets cause area of effect damage) and Rampage (kills increase weapon damage for a limited time). Neither of those is the exact set of perks you want, so every time you get that hand cannon, you're checking out what perks it has to see if it has the ones you want. There are further layers added to this as the "Masterwork" system has been redone so that it has multiple levels that you have to pump resources into in order to increase a certain stat (such as Range, Reload Speed, Accuracy, etc), and infusing a higher level unwanted weapon into another one costs more now (a combination of Glimmer, Legendary Crystals, planetary resources, and Masterwork Cores [a rare commodity]) so that process is now a careful consideration rather than an offhand thing. All of this means it's exciting to get loot again and you develop more of an attachment to it as you're invested in its development/progress as an extension of your character; and with all of the different daily/weekly challenges and bounties, there are plenty of ways to get loot now. Beyond the looting and shooting, though, Forsaken presents one of the better cohesive narratives in the game thus far that also does a good job of creating enough mystery to leave you wanting more. I'll avoid any kind of story spoilers here, but Bungie has learned from past mistakes and I found myself wanting to progress through the campaign all the way to the end to see what was around the corner. The final boss feels like an actual boss encounter instead of just another enemy with a bigger health bar. Even more surprising, perhaps, is that the raid that launches this Friday is directly tied into the story missions you play, thus piquing my interest in it even more. I doubt I'll be checking that out anytime soon, but the new Dreaming City zone has plenty to offer. While I'm hesitant to make any kind of final declarations about the Dreaming City until I've seen how it changes/evolves as Bungie has stated in their promotional materials, I will say that so far, it is the smartest move they have made thus far. This feels like an endgame area that offers players plenty of opportunities to progress/increase their Power Level, while also offering alternatives to the Raid for folks (like me) that can only get a couple of friends together at the same time. Enemies just wandering around the zone vary from between 10 to 50 Power Levels above you when you first get there, meaning you're forced to adopt a different play style to survive instead of the usual just run-and-gun through everything. There are mysteries and secrets to discover all over the place, and The Ascendant Challenge is some of the most fun I've had in putting my Destiny skills to the test since a handful of the Raid encounters in the first Destiny. Then there is the Blind Well event. The "Warmind" DLC introduced the "Escalation Protocol" as a different kind of endgame challenge for folks, which was a different kind of horde mode that alternated between "kill x number of enemies" and "do this set objective" over the course of 7 rounds. With the Blind Well, the time commitment is much shorter (I'd say on average it's around 10 minutes total), and the tasks are more straightforward (just kill enemies). Over the course of the 5 rounds of the Blind Well event, you'll be shifting around a big arena and huddled up with your fellow Guardians in set safe areas. Enemies will spawn all around and you'll be taking them out while trying not to wander too far out of the safe area. Occasionally, special enemies (plaguebearers) will spawn with shields that can only be taken down by first eliminating another enemy (labeled as "The Anathema"). Once you kill an Anathema, they drop an orb that you run over to pick up and that in turn gives you a buff called "Harmony" that allows you to damage and bring down the plaguebearer's shield. With that shield down, everyone can start doing damage to the plaguebearer directly. This same mechanic applies to the bosses you'll face in the final round. There are different tiers to the event (ranging from 1 to 3, with possibly another one above that) and each one increases the Power Level of enemies and the types of enemies that spawn. My first time rolling into the event, I was around Power Level 507. Even at Tier 1, enemies were above me, but I was able to kill them. I did a few rounds of the first two tiers with a random group that was in the area and did fine. Then we tried Tier 3 and I instantly felt useless. Enemies were now well above my Power Level and were completely immune to any damage from me. I spent the first round just wondering what to do and wondering if I should just go to orbit, when I stopped and thought about my class. I was a Titan. Sure I couldn't do damage, but I could provide support and, if nothing else, act as a shield. I placed Barriers to cover allies from blindfire on their flanks, or used it to give me a couple precious seconds to revive them. The new Titan Void Super allows me to put up a wide protective barrier in front of me (similar to the Phalanx shields) that blocks incoming enemy fire and also boosts outgoing weapon damage from allies that shoot through it. Despite not being able to directly contribute the efforts, I was not "out of the fight." It was one of the most interesting and weirdly meaningful co-op experiences I've had in the game since the first time I played the final campaign mission ("Chosen") last year and was randomly matched up with other players as we launched our assault on Ghaul. In that case, I felt an attachment to these strangers as we pushed through Red Legion forces and made our way to Ghaul's ship in much the same way I felt an attachment to the random strangers I encountered in Journey. While being over my head with the Blind Well wasn't the same, it came close. Destiny 2 still has its problems, despite all the improvements that come with Forsaken. While you'll get one new subclass Super for your character just by playing through the new campaign (and acquire it through, in my opinion, an interesting mission), getting the other two Supers seems to require playing through the Tiers 2 and 3 of the Blind Well to get "Seeds of Light," which are rare drops. In other words, new features are locked behind character progress and mandatory participation in an event where you're at the whims of what amounts to open-world "matchmaking." I get, to some degree, how Bungie may want to space these things out so players have a chance to play around with their Supers before getting a new one, but it seems like they could have achieved the same effect by making their acquisition a weekly reset. It's worth noting that that this same ideology applies to acquiring perhaps the one Exotic most players will want (Cayde's Ace of Spades hand cannon), which requires you to play the new "Gambit" PvPvE. It's a fun mode, don't get me wrong, but boy, Bungie really wants you to play it and forces you to do so if you want that gun. Speaking of Exotics, that whole system is a bit of a mess right now. Drop rates are decreased, which is fine to make them feel more unique, but you can still get duplicates including stuff from the first year of Destiny 2. That brief joy you felt at finally getting an Exotic engram is quickly overwritten by the thought that you'll be getting those same Titan shoulders for the 5th time. Xur doesn't help any, either, as you now have to scour all over the universe to find him and once you do locate him, you're probably not going to be happy with what he's selling. Seriously, I understand some people enjoyed not being told where he was each weekend and trying to track him down, but isn't that joy tampered by the fact that doing so requires waiting through 10 different loading screens only to be disappointed he's selling nothing you actually want? Despite these issues, Destiny 2 is now at a place where, in my view, it's exciting and fun to play again. Every day there's something to do - whether it's progress a weekly challenge, complete a daily one, or just wander around looking for lore and uncovering secrets - and you can do all of that solo or a couple friends. It may have taken them a year to course correct, but Bungie has definitely moved things in the right direction. Ed. Note: Two PC codes for the Digital Deluxe Edition of Forsaken were provided to Co-Optimus by Activision for review/streaming purposes.